The arts play an important role in the whole-education approach at Villa Maria. Here, in a smaller, more inclusive arts environments, our students are able to participate, take risks, and express themselves as never before, through a variety of arts forms, including music, theater and the visual arts. Many students, who may be struggling with academics or having difficulty realizing their niche, find in the arts an arena to demonstrate their exceptional talents and abilities. They discover an exciting energy, a newfound confidence – a chance, at last, to shine. Pablo Picasso said, “Every child is an artist. The problem is how to remain an artist once he grows up.” To that end, Villa Maria seeks to help students develop a lifelong appreciation of the visual arts, through a study of art history as well as exploration and experimentation in a variety of art media and techniques – including painting, sketching, collage, ceramics and more. We are proud of our artists (and they are proud of themselves), as their many wonderful creations are displayed throughout our school for all to see. Music is a universal language, a bridge between verbal and non-verbal expression. Music education promotes self-discipline, higher order thinking skills, and perceptual motor development. 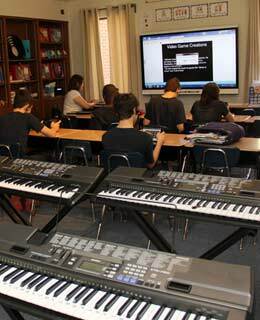 Villa Maria believes all students can learn to perform and appreciate music, as we provide a wide range of musical experiences for students – from younger students learning new songs and how to keep the beat, to older students reading musical notations and keyboarding with the use of electronic keyboards. Each year, Villa Maria students participate in a musical, an opportunity to demonstrate their talents while building self-esteem and confidence. All students participate, whether as actors, chorus, set design and creation, or stage crew. Recent productions have included Willie Wonka, The Music Man, Into the Woods, Oliver, The Wizard of Oz and The Sound of Music. Students are also encouraged to showcase their many talents in the annual talent show. In addition to singing, dancing or playing an instrument, the students display artwork, crafts, poetry, photography and trophies related to accomplishments in sports, horseback riding, chess, and crafts.